Located at the end of a private drive leading to the River Itchen, a landscape garden design was drawn up to complement the extensive refurbishment of an existing manor house with extension and swimming pool. The design proposed the remodelling of an existing pond to include a boat house set on a lake. The lake was to be fed with streams and pools both formal and informal to reflect the character of the landscape and setting of the house. A ‘pod’ was proposed in the western corner of the grounds to look over the lake and house, maximising views to the Itchen Valley and beyond. 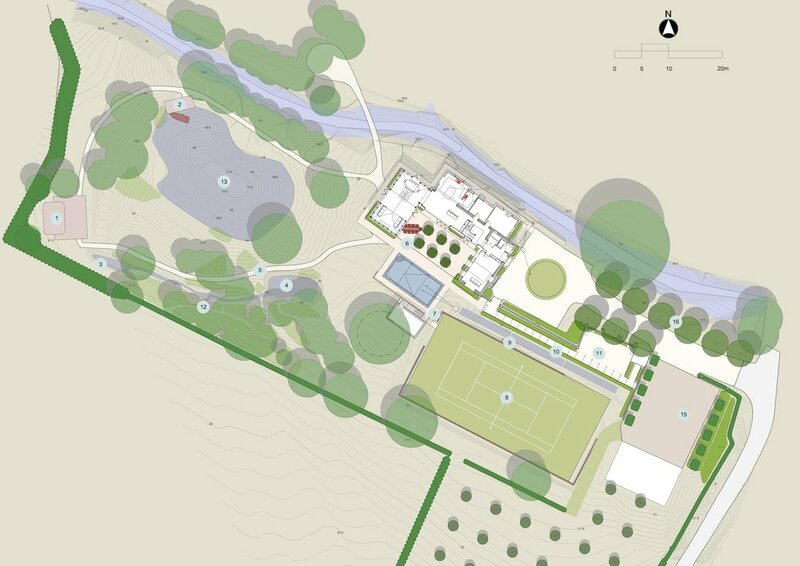 An orchard and lawn tennis court were proposed to complete the landscape garden design together with walled garden, pergola, herbaceous borders and sensory planting.